The John Solitude Project was originally founded early 2004 by a Belgian citizen with a master degree in social science, gambling researcher and player, who became disgusted of the large amounts of disinformation and misleading advertisements to be found on the internet (often to the expense of the less informed player). An individual who witnessed how many casino players, young and old, even relatives and friends lost terrifying amounts of money on roulette, often misled and even encouraged by commercial roulette strategy scammers and conmen, suggesting players fortune if only they would buy this or that kind of strategy. In the mean time the original founder was joined by two experienced roulette players, an ex-dealer (‘croupier’ if you are a European), a statistician and a webmaster who works for us for a small commission. John Solitude does not condemn gambling or gamblers, we accept it as part of human nature. We are all players ourselves, so we know what we are talking about. Nor, do we condemn decent information being sold on gambling, but we’ll take a stand against anyone who deliberately wants to deceive players to gain personal profit (including the casino’s themselves, who will psychologically try to seduce you into playing longer sessions for larger stakes -read the psychological analysis in our guides). In May 2005 the first public version (v3_1) of the John Solitude Wheel Frequency Analysis was released for free on the internet. It soon spread to several websites and forums which continue to host the pdf-file as we speak. Commercial roulette strategy sellers soon tried to discredit the guide in fear of their revenue. Portions of the previous guide were even translated in Spanish and Russian. Due to the large distribution which occurred on different channels simultaneously it is difficult to get an exact estimate on how many guides there were downloaded or send by e-mail, but the number has surely gone over 5.000 distributed copies worldwide in less than six months. It became the highest distributed free guide on roulette in the shortest amount of time. 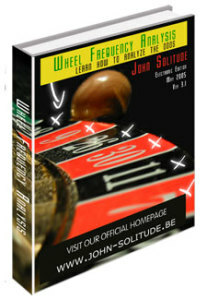 Together, our expanded team joined to write the follow up to the John Solitude Wheel Frequency Analysis which is the John Solitude Roulette Fact and Fiction guide, released in 2006. Why did we write the John Solitude Fact and Fiction Guide? In the mean time the authors received many questions concerning roulette. It became very apparent that a lot of players have become victim of disinformation by internet scammers whose only goal it is to take financial advantage of non informed roulette players. The rise in websites which sell roulette systems, – strategies and – devices is staggering and alarming. In the far majority of the cases seller websites contain misleading advertisement and disinformation concerning your chances to win on roulette. Often sellers will try to escape prosecution and damage claims by including a disclaimer in small print (often hard to find) mentioning the information offered is not factional. When you read this, you KNOW you are on your way to being scammed, otherwise the seller would not mention it. Being a group of well informed and experienced players it wastime to counteract and put up our own website. Decent advice from experienced players for players. And, we’ll give you the information for free on a base of a solidarity between players. Why did we start the John Solitude Roulette initiative? Who is John Solitude? John is a very common name in the English language. The most well known is John Doe, a name which is used to describe an anonymous figure or a defendant. Each language has its own version of the expression ‘John Doe’. In Belgium, the expression is Jan Janssens, in France he is called Jean Dupont, in Germany it’s Max Mustermann, in Japan they address him as Nanashi no Gonbei. Every language has it’s own John Doe. So John Doe is a universal character. Solitude is used to describe the existential loneliness of the John Doe character. Playing roulette is essentially a loner’s game: although many times played in the company of others, the essence of the game is woman or man versus machine. This is an epic battle of all times. Lots of John Doe’s are to be found in casinos and gambling halls. The common man or woman, mostly with a moderate income and a dissatisfying dead end job or no job, hoping that luck will come his way when he enters a casino. John Doe is looking for an escape for the spiritual emptiness of everyday life, the loss of dreams and partners experienced along the way. The casino offers John Doe exactly what he or she wants: escape from grey existence. On each visit to the casino the far distant dream rises, he or she will make fortune. John Doe looks with envy at the high rollers (gamblers who bet decadent amounts of money) and decides to take a shot at it. John Doe loses more than he wins in the process but he or she will try again. One wonders why others always seam to be more successful in gambling? 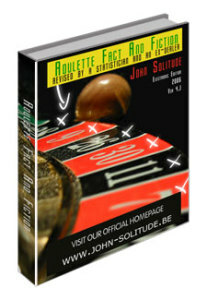 The John Solitude Roulette Fact And Fiction Guide is a completely free gift from a couple of experienced players to you. You might as well be Jane Doe, it does not matter. This is an act of solidarity with all John Doe’s, male or female. We have nothing to sell, we are not businessman, we are not affiliated with casinos, nor do we want to be or aspire to be. To further expand the distribution of our ultimate playing guide to roulette – over 125 pages of information, explaining all you need to know to evaluate your chances -, we did decide to put up this website, especially to warn you for all kind of roulette strategy scams going on the internet. Yes, the guide it really FREE, can you believe that in this day and age: no strings attached what so ever, no product to sell, and as such we were able to write something that is honest and exposes the difference between fact and fiction. This time it is us, as human beings, as occasional or compulsive gamblers, as John Doe’s versus the casino. This guide contains information for the novice as well as for the more experienced player. The only prior knowledge needed is knowing the basic rules and payouts of roulette. This guide will teach you how to become a more successful player in roulette. The guides do not promise you unrealistic, get rich overnight scenarios, but offer plain, straight forward, logical and human advice, and you’ll become more aware of the risk that is ALWAYS involved. And, you don’t have to be a math genius to follow the calculations, everything will be explained so that even someone who only knows basic arithmetic such as adding, subtracting, multiplying and dividing can understand. When there are frightening terms like ‘standard deviation’, we will try and explain in an easy way. The casino and gambling are metaphors for taking it up against forces which are far more powerful than you. From the very moment you enter a casino the odds are against you, the chance of success in the long run is far smaller than the chance of winning. As such for John Doe the casino is an example of his everyday life; he doesn’t seem to succeed as a winner, and he longs so much for this. Becoming a winner is what westernized society is about, it is what we long for. To be special, it’s everything else other than being John Doe. To feel that we were able to face a fierce enemy (in this case the casino) and conquer it. To defy the odds and get away with it. The guides contain everything we know about gambling in general and especially roulette, which is still our favorite game. It took much study, practice and a change of playing attitude to become a more successful player. An approach how this can be done, is explained in the guides. The guides are an all in one package: strategy always comes with money management, self discipline and awareness. None of these can do without the other in the process of becoming a more successful player. It is essential you read the guide from a to z, otherwise essential ingredients of the method will be missed. Print it out, distribute it for free, take your time, sit back and enter the world of the defendant John Doe. The only thing we ask if you distribute this guide or display it on your website you refer to our site. Please do not disassemble the guides: the strength lays in it’s totality. This extensive work could not have been done without the direct or indirect aid of others. Some provided in the exchange of ideas, others were helpful by giving feedback or asking questions which made us think or inspired us. Sometimes help came for free, other advice had to be paid for. The guide aspires to be the best advice one can be given when someone asks the question: how should I play roulette? Especially we thoroughly examine all kinds of myths surrounding the game of roulette. Beliefs, not facts which can often prove very expensive for the uninformed player. This one is for all John Doe’s who are out there: we are numerous and it’s time to use our common experience for our common advantage. This time it’s us versus the casino.